Wide range of belts suitable for processes before, during and after cooling tunnels. Non-adherent belts for very sticky dough conveying. Silicone belts in white and transparent. Smooth, non-stick belt top cover with excellent release of sticky products. Standard PU belts in white, blue, light green, brown and ocher. High flexibility for knife edge applications. Possibility to weld profiles and sidewalls. Low adherent, non-stick belt cover for a good product transfer and positioning. Smooth, homogenous, non-porous, easy to clean cover. 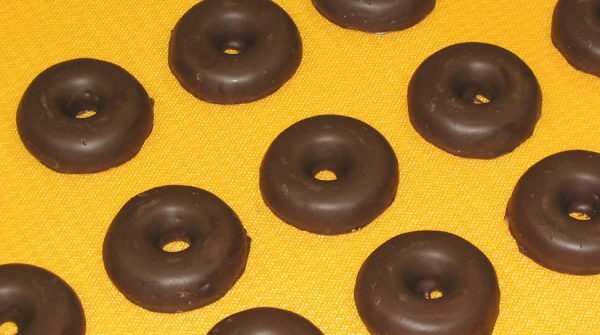 Avoid chocolate accumulation on the product base. Polyester matt belts, in blue and natural. FDA and EU10/2011 food quality both the belt and their raw material. 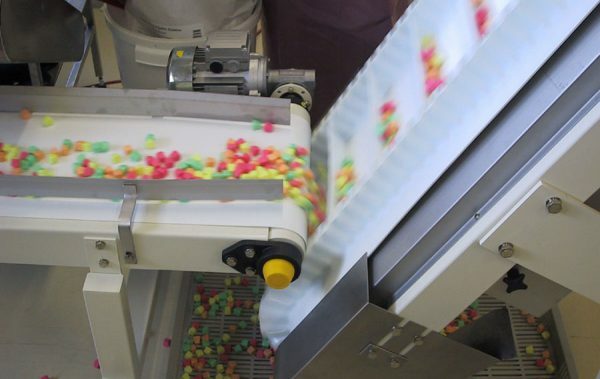 We offer a wide array of conveyor belts for the different manufacturing processes of chocolates, toffees, candies, sweets, caramels, chewing gums and other confectionary products. 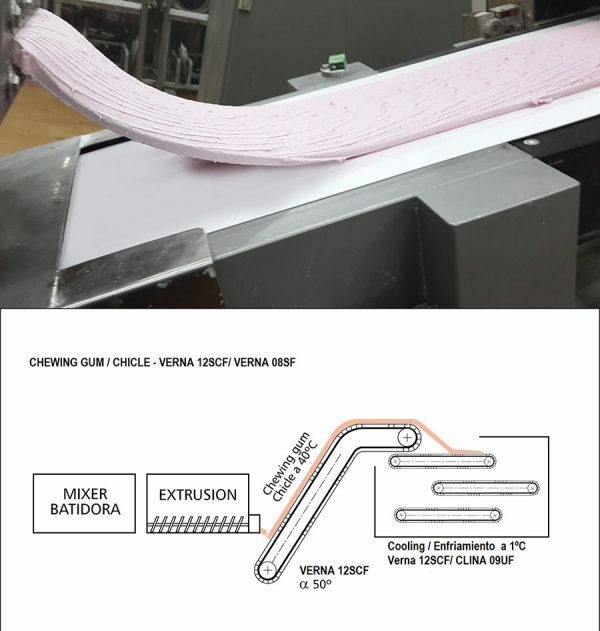 For conveying warm extruded sweet dough that is very sticky, our silicone VERNA belt series with their good release property yield excellent performance. Depending on the load and pulley diameter, the one or two-ply belt may be used. For conveying cold and non-sticky dough, our PU belts in the CLINA series, e.g. CLINA 09UF works very well in this application. Where loose candies need to be elevated, cleats and runers can be welded by high frequency machine onto the top covers of CLINA 10UF, CLINA 12UF or CLINA 20UF. Where scrapers are used to clean the belt surfaces during processing we recommend using our POLER series which are non-stick belts of thermo-polyester-elastomer (TPE) material and have excellent abrasion resistance. 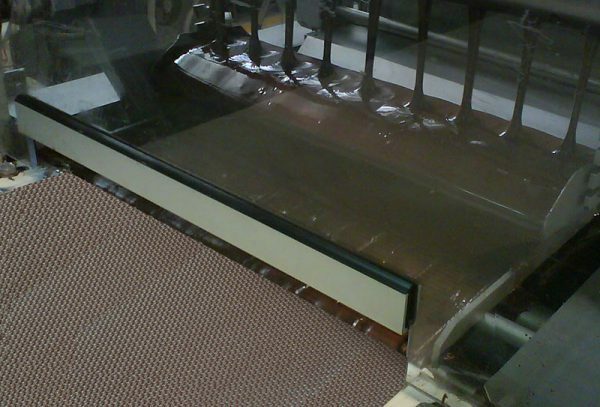 For chocolate bathing outlets and cooling tunnels, we have a full range of PU and polyester belts that can withstand low temperatures while maintaining high longitudinal flexibility for working on knife edge applications. Silicon belts VERNA 12SCF, VERNA 12SUF, VERNA 08SF, CLINA 09UF for chewing gum applications. CLINA X 06K1F for chocolate bathing outlets. CLINA 20UF with PU profiles and sidewalls for candy application.